Although we only stayed for one night, we'd love to stay here again for our next visit. It felt like home indeed. the hotel is somewhat old and the entrance to the apartment was a bit depressing, but the rooms were spacious and very clean, nice kitchen, so and so internet but free! good connection to Melbourne city via tram. I was surprised at the large size of the apartment and it was spotlessly clean. Very welcoming and happy staff. Cannot fault it...a great place to relax for such an amazing price. Great value for service. Excellent location close to city and easy access to public transport. Have stayed here on many occasions. It was clean and economical. Breakfast was overpriced for the choices you had. Excellent customer service! and the room was very clean and tidy. good size and amenities. Parking facilities were very convenient as well the tram right outside. Great, friendly staff. More than happy with my stay, especially the electric blanket on the bed for use during the winter! Very happy with our stay, the convenience of being close to the rch was great for us. Convenient address, meets most needs, happy to stay again. We loved it close to the City, Victoria Markets and etc as advertised it was very good and even transport wise, we have enjoyed our 2 day stay next time will be longer and we have also recommend to our families and friends that will be the best place to stay on their next visit to Melbourne. 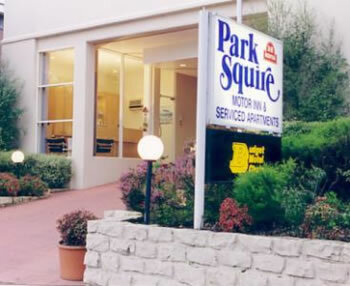 I have always stayed at Park Squire when going to Melbourne and will continue to do so. Staff were great, location is excellent and room was very clean and tidy. Stayed here many times. Affordable and convenient! The location is good and the rooms are comfortable. I have stayed on numerous occasions and will stay again. Good value. Very good budget accommodation for 3 adults. Room 12 at rear very quiet. I've stayed at more expensive places and got much less. This is my second stay within an apartment at Park Squire - great value for the price. The staff are friendly and helpful and the rooms are clean, comfortable and spacious. My next stay in Melbourne, will definitely be at the Park Squire. great location with easy access to transport. rooms are clean and tidy , perfect for anyone just looking for somewhere to sleep. the room was very quiet also which made it very easy to sleep in. Check in was advertised as 1.00pm but we had to wait on hard chairs until 2.45pm to get into our room. Disappointing. On the positive side beds were very comfortable and the shower was very hot. Was really good and comfortable. I love to comeback anytime. As we expected. Comfortable, Friendly staff. Nice and clean place..Friendly staff at reception..Close to women's hospital.. Excellent value and great comfort. We travelled for work, so the location was convenient and the room was clean and comfortable. This is the 2nd time we have stayed there and it was great both times, no hassles at all. Thankyou very much. as usual a great stay. Very comfortable - its in the perfect place for us when we need to visit the RCH. Great value for families. Excellent value for Money and a great place, spacious and very clean. We are very much pleased with your hotel and service and look forward to book your hotels again.... Thanks a lot for your service... I definitely recommend your hotels to my friends and family. Excellent service from the time i walked into reception and all the way till i handed the keys back to reception 4 days later. value for money, excellent location, fantastic facilities, we will definitely stay here again in the future. All good and very happy, except hairdryer didn't work and the back panel of the wardrobe seemed damaged revealing a mess of dust and cable.